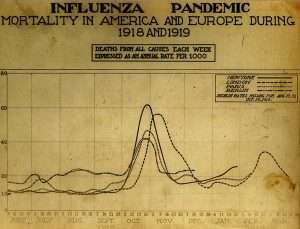 The world in 1918 was emerging from under the pall of a World War that had claimed 38 million lives, and yet in the span of only one year, just as many lives would be lost to the Spanish Flu—an influenza pandemic that is still regarded the single deadliest epidemic in recorded history. The disease reached all corners of the world, from the Antipodes to Europe and Asia, eventually claiming 20–50 million lives. The 1918 virus caused unusually strong symptoms, described by one physician at the time as "a blood-tinged froth that sometimes gushed from (the) nose and mouth". The disease also had an incredibly high mortality rate of 10–20%, which combined with a high rate of infection meant that up to 6% of the world's population died due to the virus. Ever since the outbreak, the particular H1N1 sub-strain that caused the pandemic has been a constant target of research by virologists seeking to understand the causes behind its lethality. In 2005 researchers in the US made a breakthrough where they isolated the virus' genetic material from a frozen infected lung sample, deciphered its genetic sequence and then published it for anyone to see. Going a step further, the researchers resurrected the virus, using chemically synthesised DNA fragments, and showed that this very literal Frankenstein's monster could kill mice at an enhanced rate compared to other extant flu viruses. For perhaps obvious reasons this case has become standard in bioethics and especially synthetic biology lectures and discussions. The 1918 virus case was not the first successful attempt to 'de-extinct' a virus (that distinction goes to a 2002 study resurrecting the poliovirus), but this was one of the first studies to actually pass through regulatory processes (the approval of the newly formed U.S. National Science Advisory Board for Biosecurity was obtained prior to publication); and of course influenza—a fast-spreading, potentially airborne virus—presents a more clear biosafety/biosecurity threat. Now, it is true that from a scientific point of view, these studies are very illuminating, and could possibly help stave off the effects of future pandemics. That logic guided the NSABB's recommendation that the authors publish the full genetic sequence of the 1918 virus. On the other hand, some experts were, and still are concerned that this sort of research can serve as manuals for future bio-terrorists. In general, research with the potential for great good but also great harm is called "dual use research of concern", or DURC. Several other research endeavours have been identified by experts as being DURCs, with a prominent example being all gain of function research, where an organism (viruses or other microbes) is modified to possess new capabilities that could cause harm. (For example, mutating an influenza virus to make it airborne.) More broadly, a lot of the discussion around DURC and biosecurity has focused on synthetic biology. This is mainly because of two reasons, both of which are integral to the synthetic biology movement. First, cheap DNA synthesis technology and second, the democratisation of science, i.e. DIYBio. Is biology really getting easier? "Biological warfare can no longer be considered the purview of only state actors. And this democratization of biotechnology means that the world is literally one rogue microbiologist away from a potentially devastating biological attack. Imagine a group like the Islamic State group with the capability and intentions of employing large-scale biological weapons." But just how realistic is this assessment? In the same article Mr Gerstein talks about new bioinformatics and the development of the (debatably) first synthetic cell and how "processes that were only a decade ago worthy of a Nobel Prize are now routinely used in labs and even in secondary schools." In my opinion, to employ this logic in claiming that DIYBio hobbyists or even a PhD-level trained terrorist in the sands of Iraq poses a biosecurity threat, is wrong. It misunderstands the very nature of scientific progress: every new advance in biology has not made life simpler to understand, it has simply revealed more of the inherent complexity of all life forms, from bacteria to mammals. Yes, processes that earned a Nobel a decade ago are routine now, but they've been replaced by even more complex tasks, and a lot more data, requiring a sophisticated IT infrastructure to analyse and interpret. Ask a good biology student today and they would scoff at the "one gene, one enzyme" idea and yet that was gospel for so many years. The era of genomics has overthrown the concept of 'junk DNA' and revealed the complex structural factors that affect gene expression. Discoveries in epigenetics and RNA silencing have brought about new synthetic biology applications, but they've also made past predictions about genetic engineering seem laughably simple. Genetic engineering has become easier, genetics has, if anything, become more complex. The fact that polymerase chain reactions are common in some schools in Europe and the US, doesn't mean they're routine in Africa, the Middle East or Asia. And, given that even the undergraduates I've taught here in Switzerland find routine DNA assembly tricky, I'm not convinced the de-skilling everyone is talking about is all that real, or maybe I'm just a bad teacher! In any case, it takes more than easily learnt lab techniques to successfully engineer an organism, let alone a viable pathogen. I think in science, especially given the incentives, we have a predilection to overstate progress. The best papers in the best journals talk about 'revolutionary' advances; they're much less vocal about the hundreds of failed attempts along the way. This makes biology seem easier and advances more inevitable than they are in reality. Ultimately, I'm really not that worried by the democratisation of biology. I think community bio-labs are a good thing; they're the museums of the future and they are integral, I think, to a more biology-literate society. However, I find no reason to think they have the potential to do intentional harm, or conversely, to build biology's version of the Macintosh. My fears about bioweapons and synthetic biology lie in the potential for misuse from state-actors rather than hobbyists and ill-equipped non-state terrorists. That I believe de-skilling isn't entirely real doesn't mean that synthetic biology hasn't become easier for trained, well-equipped scientists. It most definitely has. You only have to look at the new slate of GM foods, the ongoing revolution in metabolic engineering, and of course CRISPR for proof. In international law, the main safeguard from the threat of biological warfare is the Biological and Toxins Weapons Convention (BWC), signed in 1975 and the first multi-lateral treaty to ban an entire class of weapons. Presently the Convention has 178 signatories, each of which are expected to internally monitor their adherence, and of which only 30 actually release their reports. However, if recent reports are to be believed, the latest BWC meeting last December was not very successful. Given the shaky state of international diplomacy at the moment and the violations of the Chemical Weapons Convention in Syria, the BWC's ability to stop state actors from developing biological weapons is questionable, especially since it lacks a verification mechanism entirely. While I cannot pretend to expert knowledge about international law or the BWC, I can say that based on my readings, I'm far more concerned about well-funded state labs than under-funded, under-trained 'biohackers'. After all, we know that the real threat for nuclear war lies not with ISIS but with state actors, and in some respects making a nuclear weapon is a far less stochastic project than tinkering with cells and viruses. But what about printed viruses and genome editing? As I've written before, DNA synthesis is now commonplace and is getting cheaper by the day. So what's to stop a biohacker from ordering up the 1918 flu virus and developing it into a weapon? Apart from the difficulties in actually working with a human pathogen, thanks to the International Gene Synthesis Consortium (IGSC) you wouldn't be able to order any pathogen's DNA, even in fragments. Every member company of the IGSC screens every DNA order against databases of sequences to identify orders dealing with pathogens. This harmonised screening protocol makes ordering virus or other pathogen DNA next to impossible. However, in case our hypothetical biohacker managed to order their DNA from a company, or rustled up the fifty thousand dollars to buy a gene synthesis machine and had the knowhow to operate it, they would still find it next to impossible to build a virus. As excellently described in an article by researchers from King's College London, obtaining the DNA is probably the easiest part of any synthetic biology endeavour. The genome editing tool, CRISPR is another recent advance that has many spooked. With CRISPR, the narrative of de-skilling is even stronger, with several scientists presenting competing claims of ease: from "A grad student could do it" to "Any idiot can do it". With CRISPR, the potential for harm is also far from certain. It is an extremely powerful tool for mutating genomes, and this could potentially be used to make viruses and bacteria more virulent. But honestly, the amount of time and expense to do this would make it an illogical choice for anyone motivated to harm. Nature has produced a frankly terrifying array of human pathogens that are easier to weaponise, from influenza to anthrax. While it is true that the ease with which an amateur can buy a CRISPR kit and try to use it is startling, I think the danger lies more in the unintentional release of (not necessarily unsafe) modified organisms rather than weaponisation. As I've outlined above, the security concerns about synthetic biology have moved on from the 2005 and 2012 virus experiments. Since then, the scientific community has learned to take biosecurity seriously. The fact that these days biosecurity/safety talks still refer to a handful of cases gives lie to the predictions that synthetic biology would lead to a proliferation of dangerous applications. Gene synthesis companies have faced concerns head-on and rigorously screen every order of DNA. More importantly, most synthetic biology projects, from high-school work to the best research labs seriously consider biosafety and security issues in their work. Much credit for this goes to the iGEM competition and its strong emphasis on human practice. This is a concept that is steadily being ingrained in the growing community of synthetic biologists and biohackers. At the government and inter-governmental level things are more unsettled, and in my opinion a lot of this is because of unrealistic demands for complete moratoriums from activist groups. Demands to ban a suite of technologies that holds such promise are both premature and often a distraction from serious talk about proper regulation. The recent approaches demonstrated by Kevin Esvelt and others, where they take the science to the people and explain the motivations and hopes around synthetic biology research, are I think, a great way to allay unwarranted fears and ensure that scientists hear the concerns of the public. This approach though must be tempered with a need for some discretion when disseminating critical details about DURC. We need to strike a balance between effective communication for building trust as well as preventing the release of detailed technologies without prior oversight. More fundamentally, biosecurity, like all security, isn't really so much about technology but about the basic causes that lead to misuse. The Doomsday Clock moved 30 seconds forward last month, and the custodians, the Bulletin of the Atomic Scientists explained that the chief reason was tensions between the US and Russia. (They also cite CRISPR as a concern, among other technology developments.) While all technological developments have led to great human advances, the potential for harm can only be realised when the motivations to do harm exist (think nuclear energy and the atomic bomb). Over the last century the world has become a more peaceful, less threatening place and we should work to ensure that the bioengineering revolution doesn't accompany a slide back into a warring past. This is perhaps too idealistic, but a world at peace would have less to worry about from any technology, including synthetic biology.